Last year I opened our Pivot staff retreat by telling a personal story about Lenin, Trotsky and leadership. I projected a picture on the wall that featured Lenin enthusiastically addressing a crowd during the Russian Revolution with Trotsky standing at his side. I told the staff that for the decade I studied Soviet history, this photo represented my concept of leadership - a charismatic, visionary, who addressed large numbers of people and moved them to action. I then shared a key insight I had at the Art of Leadership at Hollyhock in 2008: Lenin was just one of the leaders in this photo. Trotsky was also a leader and there were countless other leaders - the people who organized the masses, the people who set up the stage, to name just a few - that made this moment in history happen. I started with this story because I was asking the staff to imagine a new style of leadership. Our retreat in September 2011 was my first as Pivot's executive director and although I had been leading the organization for more than a year, I had yet to articulate my leadership style to the staff. I once again projected the image of Lenin and Trotsky on the wall - except this time an image of one of our staff members was photoshopped into Lenin's position and I was photoshoppped into Trotsky position. I went around the room and did this for each staff member. I promised that I would work hard to create the conditions for them to thrive at Pivot. In return I asked for their commitment to being a leader, their creativity, and their honesty. What am I doing that I deeply care about? What have I done that scared me? Surprised me? Provoked me? What did I accomplish that most matters to me? What have I learned? What did I have to let go of? What is my vision for the coming year? What help will I need? Who will I need it from the most? This exercise took the entire first morning and by the end each of the staff had presented full, authentic pictures of their work, their vision, their vulnerabilities, and their needs. Everyone spoke with passion, conviction, and even a little humour. When I took over the leadership of Pivot, I took a risk. It was a very calculated risk, but it still felt like a gamble. I asked the staff to work with a new style of leadership - one that put each of them at the centre in their own respective areas of expertise. As executive director I would supply the tools for success, but the responsibility for growth, movement, and ultimately Pivot style social change rested with the staff. There were a number of structural changes that made this leadership paradigm shift more possible, but the change required staff to lean-in and be accountable, to put ideas forward, to work together, and to make hard decisions. When the presentations on the first day of our retreat finished, I was certain that the gamble had paid off. I was in a room full of deeply connected leaders. The connection was important because the rest of the day was spent having difficult conversations. Two years ago we committed to regular feedback sessions between staff members - one of the goals of this retreat was to deepen our feedback process. In order to engage, react, and experiment in our busy non-profit our team has to be able to know when to move an idea forward or leave it on the cutting room floor. Central to this is the ability to interact with each other honestly with compassion and authenticity. It is not without pain, but it is collective muscle we are building. This first day set the stage for the rest of the retreat. It opened us up, got us better connected, and prepared us for the collaboration, arguments, decisions that lay ahead. We spent the next two days planning the next twelve months for the organization – we discussed vision, goals, strategy, tactics, and workplans. We finished the week with two days in Whistler at a borrowed cabin letting the conversations, plans, and warmth of our shared retreat experience integrate and sink in. 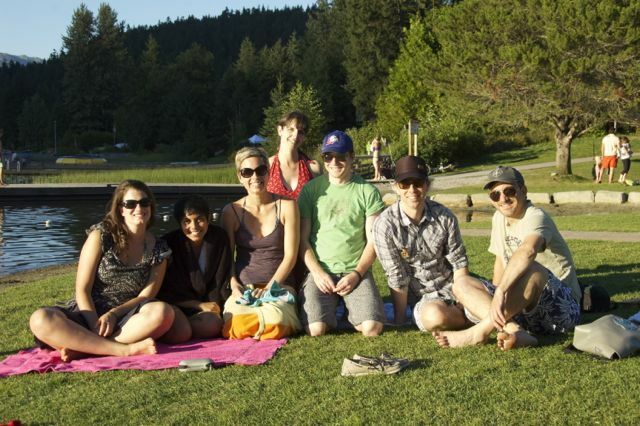 We talked, laughed, played board games, cooked food together, and went swimming in the warm Whistler sun. As we consciously slowed down, relinquished our cell phones, shut down our computers and spread out on the floor with paper and markers, I felt a clarity that was simultaneously calming and energizing envelop the group. We talked through challenges and we adjusted timelines. We made decisions about priorities that involved committing to some new work and letting go of some projects that were not effectively advancing our core objectives. We talked about which tactics we would employ to meet our objectives in each campaign. In the process, and we found places where we could offer one another more support in our work and share expertise more effectively. 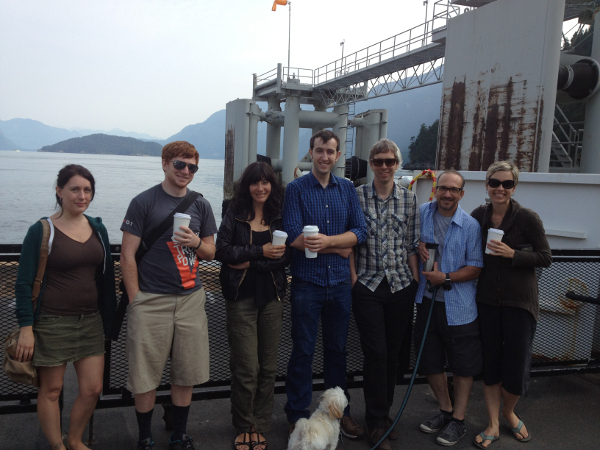 When we arrived on Bowen, our facilitator, Kathryn Thomson, noted that we all seemed a little bit fidgety and nervous. We all confessed that we were feeling anxious about presenting to each other. Isn’t it funny that our staff, who regularly speak to major media and audiences all over the world, were feeling very nervous about presenting to our small staff of seven people? But the reality is that, along with the deep respect and trust within this group, we also know our job is to push each other to have the greatest positive impact on the world. We came. We saw. We planned. I would like to thank Kathryn Thomson from Leadership Mind who has facilitated so many of our important conversations over the past three years. Thank you for your love and support! Special thanks to Joel and Dana for lending us their home for our retreat – an airy, beautiful space makes all the difference!